Space… The Final Frontier… This is the 5th full-length Symphonic-Industrial Death Metal voyage of the I-have-dubbed “Space Metal” band MECHINA from Illinois, USA; and it is the soundtrack that any and all space adventures could ever need and want. Don’t believe me? Well then set phasers to planetary annihilation, because you’re about to get a crash course in the Space Metal Epic that is “Acheron”. And straight off the landing this album delivers with one of the best intro tracks I’ve ever heard: “Proprioception”. It’s not the best because it’s the most technically advanced or the most musically adept, but because it instantly captures the sensation of being in the middle of a Sci-Fi movie while delivering a shivers-inducing buildup for the next song and the album as a whole – This is how you start a concept album, folks! “Proprioception” flows naturally into the first real song on the album, “Earth-Born Axiom”, which is the equivalent of an Epic, beautiful-yet-terrifying orbital bombardment that opens fire with that instantly recognizable and arguably unique MECHINA sound to the background of a mighty choir, that only gives its target a breather during its reload. To my great joy I found here, so early on the album, that the previous issues MECHINA has had in regards to their sound has been fixed – this sounds little short of amazing! And the song itself is Epic, powerful, and like all bombardments it’s long and gets repetitive and tiring after a while, a result of being an eight and a half minute long monster nigh-on devoid of vocals. But even so, it’s pretty great and it actually grows the more you listen to it. But once the bombardment stops, that’s when the flagship of “Acheron” comes crashing in in the form of the oh-so well-named third track “Vanquisher”. Like a healthy mix of the previous track and the opening and title track of their previous album “Xenon”; “Vanquisher” is an all-powerful, Epic and semi-Progressive onslaught that unlike the track before it knows for just how long it can fire away before growing tiresome, which is much helped by the now-emerging and returning growls of Dave Holch to guide us through our space odyssey, making “Vanquisher” a true pride of MECHINA’s fleet and an unquestionable highlight of “Acheron”. Towards its end it fades into a spaced-out Atmospheric interlude that like the aftermath of a battlefield allows the dust to settle and the humanity to resurface, and it is in the aftermath of “Earth-Born Axiom”’s and “Vanquisher”’s devastation that we start to see a new side of and a few changes to the sound of MECHINA, as on the 4th track the album starts to take on a new form. “On the Wings of Nefeli” quickly opens up into a very peculiar and foreign-sounding chant that effectively works as the song’s chorus; an interesting touch that actually works out pretty damn well as the song takes on a slower and more Melodic form than the previous songs, allowing for a sensation of afterthought and spirituality to come through as the Atmospheric and Symphonic elements take a larger role, giving off some serious “Empyrean” vibes. Like “Vanquisher” it too fades into, or rather dies off and then allows for, another Atmospheric interlude and buildup to the next song and my personal favourite off “Acheron”: “The Halcyon Purge”. And with such an ominous name, surely great things are to be expected? Quite so as MECHINA shows off its best songwriting ever (a factor that actually surges through all of “Acheron”) with a diverse, dynamic and emotionally charged song that encompasses a haunting and mesmerizing chorus by guest vocalist Mel Rose, who makes a return from the amazing single “To Coexist Is To Surrender”, that just sends shivers down my spines. It’s also interestingly enough the shortest song (not track) on the album, which may be a factor as to why its songwriting stands off in opposition to the rest of the album’s lengthy tracks. And I believe this is, just before we head on into the peculiar track “Lethean Waves”, a good time to stop and talk about some of the changes that has happened with MECHINA since we heard them last. First off, Dave Holch appears to have retired his auto-tuned and computerized clean vocals in favor of either choir-lead chants or female-lead singing (as we will discover in the songs ahead of us) by returning guest vocalist Mel Rose. I won’t lie, as a returning MECHINA fan, I was initially set off by this but after a while I came to realize that it actually works out pretty well – if not better than before. Mel Rose’s voice is distinctly superior to Dave’s clean singing, no offense to our favourite space monster growler, but like a spoiled child I can’t help but want both. Secondly, MECHINA has decided it’s a semi-Progressive band and on average increased the length of each song by a few minutes. Now for the most part this actually works out in their favor, but there are instances where it backfires and the songs end up becoming a little tiresome and repetitive (yes, I’m looking at you “Earth-Born Axiom”; you had no right to be that long). Thirdly and most importantly, MECHINA has embraced their Atmospheric side and gone full Experimental with it, allowing not only for lengthy Atmospheric and semi-Symphonic sections that sometimes border on Avant-Garde, but full-fledged, spaced-out, Atmospheric instrumental-only songs. This is in all honesty a mixed bag, with some results being amazing while some being a little pointless, and a good example of this is the next and 6th track on the album, “Lethean Waves”. As the first of 2 (not including the intro and outro tracks) Atmospheric instrumental-only tracks on the album, “Lethean Waves” is on one hand the better of the two and is actually a pretty good Atmospheric track in its own right that captures an Epic, mournful and sort of spiritual aspect of outer space, but is on the other hand it kills the momentum the album had built up due to simply being so calm and frankly too long, I think. However that’s quickly fixed as another highlight off “Acheron” comes in to take its place, “Ode to the Forgotten Few”. Mel Rose this time takes the lead on both verses and choruses, and produces a kind of song we’ve never heard from MECHINA before: A ballad, and a damn good one at that! It’s beautiful, haunting, mesmerizing, emotional and just a delight to listen to; even though I’m sure the more aggressively aligned listeners will hate it with a passion for being the antithesis of what they were looking for. Well don’t worry knuckleheads, because if anyone thought that this change of pace was permanent, they need only listen in on the last 2 minutes of “Ode to the Forgotten Few” where the song turns into yet another interlude - but this time one with a passion and purpose as it leads into a space battle extravaganza in the form of the mighty beast that is “The Hyperion Threnody”. And if the name didn’t sound Epic and powerful enough, the song wastes no time reminding us that this is a MECHINA album as it fires off on every cylinder into a 9 and a half minutes long carnage. And unlike “Earth-Born Axiom”, which lost its path and prevalence along the way, “The Hyperion Threnody” remains beastly powerful and interesting throughout its extended length and sadly proves to be “Acheron”’s final highlight. This is made increasingly obvious as the following track, “Adrasteia”, is, for a lack of better words, boring. It’s the other all-instrumental Atmospheric track on the album, but unlike “Lethean Waves” it lacks presence and purpose, making it an effective time-waster. It’d make a pretty great background track to a game, but as a track to actually actively listen to, it’s pretty dull. And while the follow-up track and final song on the album, “Invictus Daedalus”, is the fastest and most furious song I think MECHINA has written since “Conqueror”, it lacks a certain something to make it interesting in comparison to the other songs, and as such can’t quite return the album to its otherwise stellar shape before the final and outro track “The Future Must Be Met” plays “Acheron” into the silence of space – it’s pretty good, but nothing special or noteworthy I found. It’s sad and so wrong to leave on such a low note, because MECHINA’s fifth full-length album “Acheron” is a massive success. The songwriting is at an all-time high, the new sound makes everything feel and sound better than it ever has done before and the Experimental route they’ve taken with their sound isn’t perfect, but it has allowed for greater diversity and an overall better album than anything they’ve produced before. 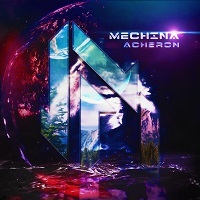 All-in-all, “Acheron” is a stellar album and the best MECHINA has produced to date, and if this is just the beginning of what their upcoming trilogy has to offer, I’ll be setting my shields to maximum as I await the MECHINA equivalent of “The Wrath of Khan”!